Baahubali (English: The One With Strong Arms) is an upcoming two-part Indian epic film being primarily made in Telugu and additionally in Tamil. The film will be simultaneously dubbed into Malayalam, Hindi and in several foreign languages. Baahubali is directed by S. S. Rajamouli and features Prabhas, Rana Daggubati, Anushka Shetty and Tamannaah in the lead roles.Apart from them, the film features an ensemble cast of Ramya Krishnan, Sathyaraj, Nassar, Adivi Sesh, Tanikella Bharani and Sudeep in crucial roles. The film is being produced by Shobu Yarlagadda and Prasad Devineni under Arka Media Works banner. Director K. Raghavendra Rao is presenting the film. The soundtrack for the film will be composed by M. M. Keeravani. National Award winner Sabu Cyril has been recruited as art director for the film. National Award winner V. Srinivas Mohan is working as the VFX supervisor. The project is touted to be the most expensive film being produced ever in the history of Indian cinema.and was also one of the few films featured in BBC's documentary on 100 Years of Indian cinema directed by Sanjeev Bhaskar. The film was shot using Arri Alexa XT camera marking Rajamouli's first film using digital camera and the principal photography began at Rock Gardens in Kurnool on 6 July 2013. The first part of film is scheduled to be released on 17 April 2015. Prabhas, Rana and Anushka did a lot of home work and hard work for the film. All of them practiced sword fighting, while Prabhas and Rana learned horse riding. It was later decided to make it a two part film which would release by 2015, due to its excessive length.Tamil lyricist Madhan Karky was selected to write the dialogues for the Tamil version. He said that his dialogues would be along the lines of yesteryear epic historical movies like Manohara (1954) and Nadodi Mannan (1958) and that they would be in chaste Tamil. The film's action sequences were choreographed by Peter Hein who revealed that each and every shot was dealt carefully and there are huge requirements which are not seen in regular movies as it is a complete period film. For a particular action sequence, Peter Hein had to handle around 2000 stuntmen & elephants. K. K. Senthil Kumar was selected to handle the film's cinematography. P. M. Satheesh was the sound designer of the film. Regarding his experience with the film, he said "Baahubali is one of the very few films in South where a lot of importance is being given to sound recording. We dropped the idea of shooting with sync sound since the dialogue delivery has to be modified accordingly. The sound design team embeds various types of micro-phones throughout the set to record the ambient sound, which will lend a natural feel to the film. It's necessary, because some of these sounds aren't available in the market. It's quite a challenge for everyone". Sabu Cyril was the art director of the film. In an interview to The Times of India, he said "Every hour is a challenge on the sets of Baahubali. Period films are a huge responsibility as there is no room for mistakes. Everything was created from scratch : chairs, thrones, palaces, swords, armor and costumes." 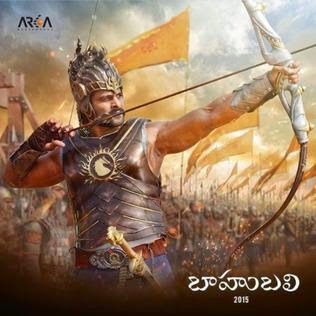 Foley Artiste Philipe Van Leer started working with the film's crew from 5 November 2014 till 14 November 2014 at Dame Blanche complex in Belgium.Rana revealed that the film is about a war between two brothers - Baahubali played by Prabhas and Bhallala Deva played by himself for a kingdom. Anushka's character's name was revealed as Devasena.Rana Daggubati was said to be playing the role of Prabhas' brother and He too underwent a lot of physical transformation for the role he was assigned to play in the film. He also underwent training in Martial arts under the supervision of a Vietnamese trainer Tuan. Sathyaraj sported a Tonsured look for his role in the film. Sudeep said that he would play the role of a weapons trader in this film.In the end of October 2013, Rana appeared at a fashion show with a beefed up body which, according to him, was a part of his look in the film.In mid-May 2014, reports emerged that Anushka would be seen as a pregnant woman for a few sequences in the second part of the film. Rajamouli's cousin and his norm composer M. M. Keeravani composed the music for this film. After the break taken by the film's team after completion of war schedule on 5 March 2014, an official statement from the film's team stated that Keeravani is recording two songs from the film right now. Madhan Karky was selected as the lyricist for the Tamil version of the soundtrack.On 2 July 2014, the film's official website published that Keeravani is recording a song at Prasad Studios in Hyderabad which is sung by Deepu. On 8 October 2014, Keeravani told Deccan Chronicle that the writers are working on the lyrics of the songs and he would start working on them in a week's time.During the film's shoot in Bulgaria, the film's soundtrack was expected to be unveiled in February 2015. The film is scheduled to be released on 17 April 2015. A number of short promotional "making of" videos has been released. For releasing all those videos, Arka Media Works had its own channel on YouTube and the team unveiled first look posters and videos featuring the film's lead stars on the occasions of their birthdays. The film used an augmented reality application to play the trailer on smart phones and tablets. The crown used by the character of Baahubali in the film was exhibited at Comic Con, Hyderabad as a part of the film's promotion. An event named Cos Play was held in which chosen winners were given a chance to visit the sets of the film. The film's unit also launched a WhatsApp messenger to give regular updates about the film to the subscribers. In early July 2014, the film first part's Karnataka and Ceded (Rayalaseema) region distribution rights were sold to a prominent distributor for 23 crore (US$3.6 million) out of which the Ceded region, which included Kadapa, Kurnool, Anantapur, Chittoor and Bellary areas, the rights alone fetched 14 crore (US$2.2 million) At the same time, the film's Nizam region theatrical distribution rights were purchased by Dil Raju for an amount of 25 crore (US$3.9 million). only for the first part. Though he did not confirm the price, Dil Raju said in an interview to Deccan Chronicle that he purchased the first part's Nizam region rights and added that he would acquire the rights of the second part also for this region.BlueSky Cinemas, Inc. acquired the theatrical screening and distribution rights in overseas.